JESUS WANTS ME FOR A SUNBEAM. GO. 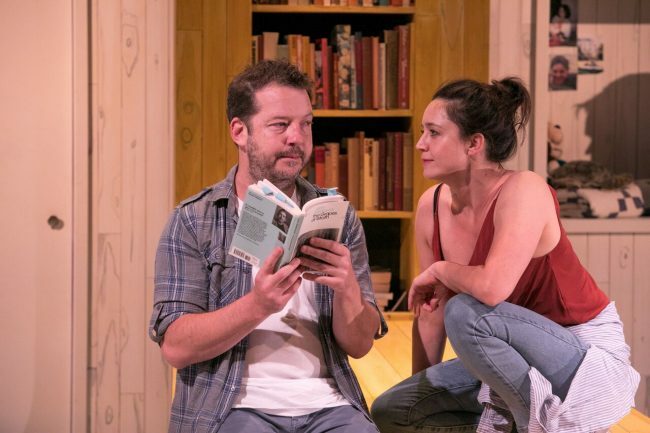 JESUS WANTS ME FOR A SUNBEAM is an extraordinarily moving night at the theatre, with performances emotionally pitched to the narrative movements of the work, accessible writing which strikes at the heart and a multilayered thematic examination of a very difficult subject. 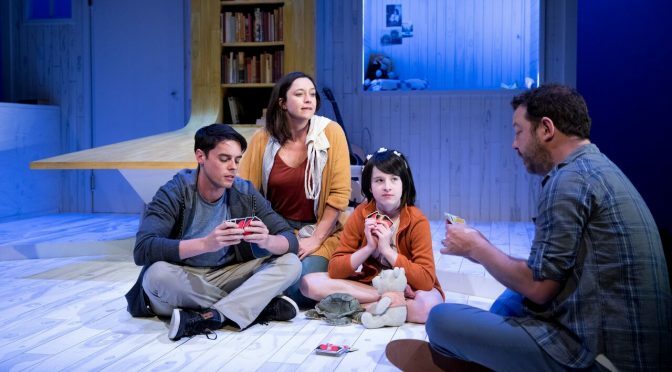 But there is an underlying reality to this National Theatre of Parramatta production: it’s not about what happens in the room. It is about issues that will haunt the watcher’s sleeping and it’s about what the play begs of us, empathy inside the judgements and assumptions when a story hits the headlines. In one room in a family home we meet the Pollards, a tight knit somewhat unusual family. They have been so, we understand, from the time Linda and Rick met. With the perfect family unit of an older boy, Ben, and a younger daughter, Emma known as Wol, the parents are very aware of the perils in life. In a presumption of protectiveness they have closed themselves off without withdrawing completely. Especially not from Linda’s parents, and Grandma and Grandpa are frequent visitors. And witnesses. Because something has happened here and Ben, now grown, is trying to work out why. Through his eyes and the reminiscences of his father, the audience is slowly made aware of what has been sacrificed in the name of the children. It is never as it seems, this play, and such is quality of the writing from Steve Rodgers (adapted from the Peter Goldsworthy novella) that the narrative carries consistency of line yet is unpretentiously mysterious. The characters are completely understandable and the moral questions are enriched by this engagement. As Ben, Liam Nunan gives a tour de force performance. He swings from state to state with jagged and torn responses to the revelations around what he actually knows and what he half remembers. Each moment watching or being present in the events, his character is portrayed with clarity and honesty and his work in the most important reveal of the piece is the heartbreaking eye of the storm. The Mum and Dad centre of the household is Emma Jackson and Justin Smith and the rapport between these two is palpable. They often move similarly by pure intuition and long acquaintance and the intellectual wrestle of the story’s ethical imperative is opened to the audience through their nuanced and touching work. The finale of this production, embodied in their paired and synchronistic expression of love will rip and gouge at your emotions. It’s awfully poignant work from them. Darren Yap’s direction is now barely visible in what we see before us. His considered and modulated expression of the sentiments of the play cohere such that the characters and story seamlessly intersect. Yap’s tempering of darkness is seen in the lovely performance of Valerie Bader who brings a lightness and fun to Grandma and his scholarly soothing of the religious themes is very evident in the restrained and genuine performance of Mark Lee as Linda’s priest. This is not a play about religion, despite the title. The subtlety of Yap’s approach is also nurtures the excellent performance of Grace Truman as Wol. Her portrayal of youth and excitement early on are uplifting to watch and her work has real depth when the story turns inward. As the themes close in, the play has scenes which slow and lengthen in exposition. Here, the stillness of implication between moments of thought struggle for repression. And the stellar lighting from Verity Hampson really goes to work. The colour choices for the cyclorama shining through the set are not too bold or varied but it is the use of side lighting that gives the rig an unobtrusive redolent warmth. 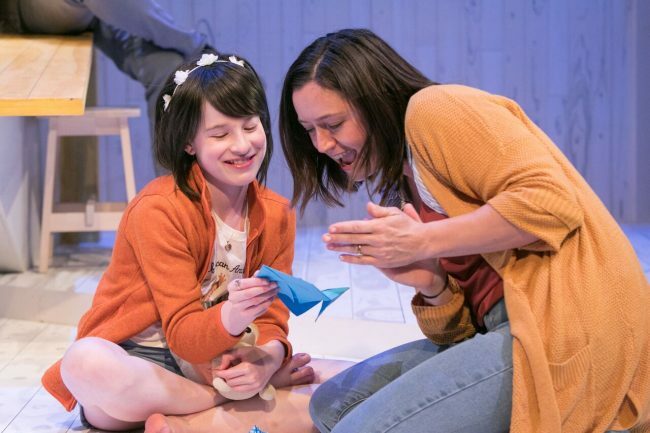 At one of the most distressing moments late in the play, the horizontal white beam picks up the tears in the eyes of Ben collapsed on the floor, it’s a tiny, vital, detail given what is going on. But the rig can also make an unflinching statement with its throw of shadows, huge and dark, on the side walls. The set and the costumes (Emma Vine) are also in concert with the text. Foregrounding autumnal, sunset colours in the vertical swathe of bookshelf which dominates the raised stage. The bookshelf grows organically from a multiuse bier which becomes bed or table as needed. The spine tones are picked out in some of the costumes. Other costumes though, delve deeper into the writing with their gentle use of a faded sensibility that is echoed in the very walls. The palette is discrete and interrogates the text for clues to place, time and age with characterful odd socks on the child and orange in the bowls. The music of JESUS WANTS ME FOR A SUNBEAM (Max Lambert/ Sean Peter) is exquisite with opening violins giving way to the resonances of the father’s guitar in the mix. In one lovely sequence the guitar travels from picking to strum with the moment in a subtle jolt of audience emotion as the music prepares you for the unassailable dénouement and finale. Little can prepare you for the power of the final few minutes of this production. Nor for the impact that its 80 minutes of inherent humanity will have on you. Whether your reactions veer toward the life-affirming or the horrified, this is stunning theatre. Created with grace. Go. JESUS WANTS ME FOR A SUNBEAM from the National Theatre of Parramatta [Facebook] continues at Riverside Theatres [Facebook] until October 27.